Ever since Hank Henshaw’s eyes glowed red in Supergirl’s second episode, viewers had been wondering what the head of the DEO’s deal was. 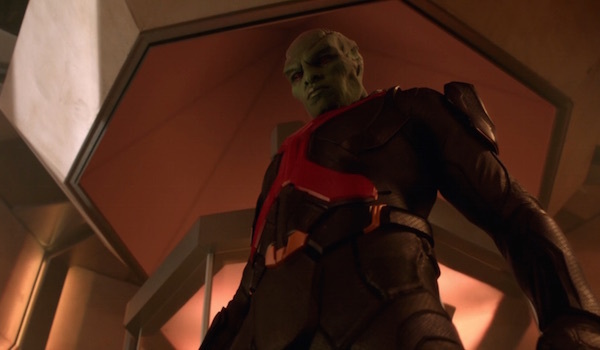 Many fans assumed the show was going the same route as the comics and hinting at him being the Cyborg Superman, but it turned out to be something more surprising in last night’s episode “Human for a Day.” After defeating Fort Rozz escapee Jemm, Henshaw revealed himself to be alien shapeshifter J'onn J’onzz, better known in the comics as the Martian Manhunter. It was a twist that few saw coming and many were excited by, but back when the Supergirl pilot was being shot, it seems the role started as a bit of a joke. Geoff Johns, Greg Berlanti and I were saying, 'It's so funny we cast David because he's got those weird ears. Like alien ears.’ I don't remember which one of us said it, but it was like, 'If we were ever going to make a Martian Manhunter show, David would have been the perfect Martian Manhunter.' And Geoff said, 'Well, why can't he be?' We already had it set up that Hank was keeping this bad secret, and then we started thinking about well, what if it was a good secret? You think he's bad but then he turns out to be not only good, but the most good person in the DC universe. After weeks of making it seem like “Henshaw” was a sinister figure, Supergirl finally revealed the truth and showed him to be a hero after he saved Alex Danvers from the mind-controlling Jemm. The last survivor of Mars, J’onn had come to Earth as a refugee. He was eventually found by the real Henshaw in Peru and nearly killed, but Alex’s father Jeremiah Danvers stopped Henshaw from doing the deed at the cost of his own life. To honor Jeremiah's sacrifice, J’onn promised to look after his Lex in return and took Henshaw’s identity to reopen the DEO and make sure Alex was under his protection. Aside from the red eyes, Supergirl had already hinted at J’onn through his powers. He used his super strength to diffuse that bomb in “How Does She Do It?” and phased out one of his handcuffs offscreen in last night’s episode. Now that he’s been outed, the show officially has two big DC heroes within its main cast, and once Kara learns the truth, no doubt there will be team-ups aplenty. However, whether the real Henshaw is truly dead is something that could be easily retconned. From what J’onn said and what we saw in the “Livewire” flashbacks, the real Henshaw wasn’t a nice guy, so if the show decides to bring him back, he could easily become the Cyborg Superman fans are familiar with and battle both Supergirl and the alien who’s been impersonating him all these years. We’ll learn more about J’onn J’onzz as Supergirl airs Mondays at 8 p.m. EST on CBS.